India is known for its richness in culture and tradition. In that case, it becomes obvious that the history of colourful crafts and arts is still living in India. Since time immemorial, many dynasties and kingdoms ruled in India and the creative imprints of their intricate designs and artistry can still be seen from the remote villages to the air conditioned shops of metropolitan cities. Hand made crafts made by skillful Indian craftsmen are highly valued in the international market. India has a long history of exporting valuable silk and textiles to wealthy empires of the world. The most know silk route that ran through India is a testimonial to the fact. Till date, the intricately designed saris of India are in high demand in the global market. It is of great interest to any art and culture enthusiast to witness how the India craftsmen produce products of such high quality using the basic age old techniques, mixed with some modern technology. As a result, handicrafts and textiles visits has become a popular choice of the tourists when they visit India. Thus, following are the most amazing and popular handicrafts and textiles visits that attract worldwide tourists in India. For any tourist who wants to see the beautiful colours of India, Gujarat must be their first stop. In their first visit, tourists will be awed by the vast legacy left and continued by the craftsmen of Gujarat. 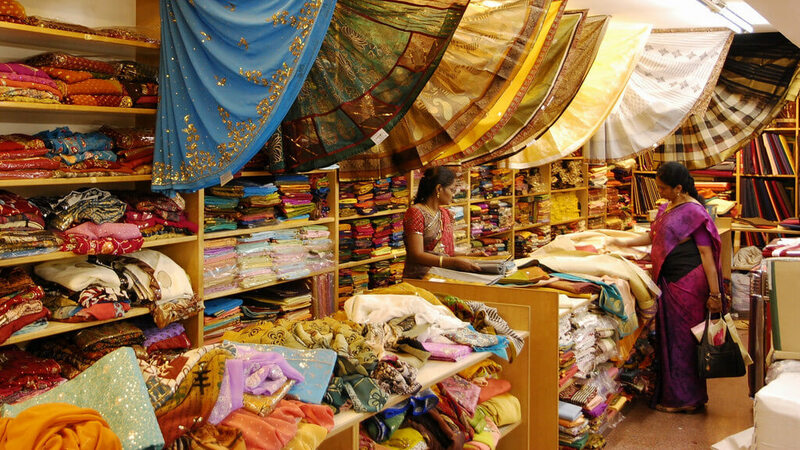 The main business lifeline of Gujarat is its textiles business. Apart from world class textiles production, Gujarat is famous for Zari, Pottery, Patola, Bandhani, Beadwork, Woodwork and Silver jewellery. A 10 night and 11 days’ package is an organised tour for any art lover to see the beauty of Gujarati artists. In this well planned itinerary, tourists are given a tour of Ahmedabad, Gondal, Junagarh, Gir, Jamnagar, Kutch, Dasada and Patan. The first day begins in Ahmedabad where the famous Calico Museum of Textiles is situated. The visit to Sayla, a village near Ahmedabad is awe inspiring as tourists can see how the intricate bead-work and weaving are done by the local villagers. The range of handicrafts that are made here is amazing and they are sold worldwide to connoisseurs of arts. Gonda is another village which is famous for its unique brassware industries. Naukhala Palace is famous for its wonderful collection of brass utensils, bead-work, silver jewelries that are an important part of rich legacy of ancient India. Jetpur is also another village which is famous for block printing and screen painting. In Junagadh museum, tourists can see the extensive collection of Nawabi textiles and beautiful carpets. Anjar city is another stop which is famous for metal handicrafts and textiles, where tourists can roam around the colourful marketplace exploring and buying stuff. On the way to Bhuj, many tribal villages are situated that are known for their characteristic embroidery called Ahir embroidery and Rabari embroidery. The varieties and multiple creativeness are prevalent in Gujarat. A nearby place, Dasada is proud of its Bharwad embroidery. Patan is another place which is known for its Patola Silk weaving. Tourists will be delighted to see how deftly weavers work here. Kumhar is a Hindi term for pottery and this secretive village located in the outskirts of West Delhi , is aptly named as Kumhar Gram. The village is home to about 700 Potter families who have dedicated their lives for moulding pots for living. These pots and earthen wares are bought by retailers and brought to the markets for sale. Tourists can go around and witness the Potters making pots with their skillful hands. The tourists can try their own hands in this art. The experience in this Pottery village is exclusive only to India. The Infomania Pottery Tour village is a lucrative tour for tourists to grab who want to visit this place. Tamil Nadu is famous for its Kanchipuram saris and textiles. Hand loom weaving of Tamil Nadu is of very high quality and Kalamkari textiles is unique to this place. The four day tour of handicrafts and textiles are famous in Tamil Nadu. This tour covers Kanchipuram, Pondicherry Tanjore temple, Karaikudi, and Gandhigram. Karaikudi is famous for its Kandanghi saris. In Gandhigram, tourists can visit the khadi spinning and weaving centre set up by Mahatma Gandhi. Write to us if you are looking for a Indian Handicrafts and Textile tour on your visit to India.